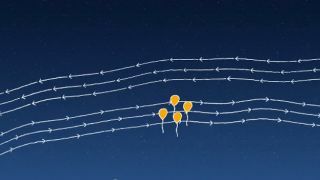 Google believes a fleet of free-flying balloons 12 miles above the earth's surface could be the key to bringing mobile phone service and internet access to some of the world's most remote areas. Project Loon, as it has been dubbed, is the latest brainchild of the secretive X Labs team headed up by Sergei Brin, which is also responsible for the birth of Google Glass. While acknowledging that the idea is somewhat 'pie in the sky', Google believes the proposed network of giant balloons, 15-metres in diameter, could bring speeds comparable to 3G to those without access. The video introducing the project says Loon could facilitate education and medical assistance to places without schools and doctors, while it could assist with communications after natural disasters, when the traditional infrastructure is destroyed. "We believe that it might actually be possible to build a ring of balloons, flying around the globe on the stratospheric winds, that provides internet access to the earth below," wrote project head Mike Cassidy. The company is already testing the "highly experimental technology" in New Zealand where it has already sent up 30 balloons. However, won't they just float away? Apparently not. Google said it can keep them in place using a new wind and solar powered-based system that allows it to control the altitude of the balloons in order to catch the right winds. So there you have it: A story about balloon-powered internet access and it's not even April 1. Let us know your thoughts on whether this can become a reality in the comments section below.